Install Android 9 Pie official firmware update on Samsung Galaxy A10 SM-A105F smartphone. After launching the Galaxy M model, Samsung is now releasing new Galaxy A series smartphones. Some of which include Samsung Galaxy A10, Galaxy A30 and Galaxy A50. If you compare these models, you would notice many similarities between them. Although Galaxy A10 launch date in India was February 2019, its images were already leaked on the Internet. Galaxy A10 specification includes a 6.2 inches of HD + Infinity V display with 720 x 1520 pixels of resolution. Powered by Exynos 7884 Octa-core processor, it comes with 32 GB of internal storage and 2 GB of RAM. To always remain charged, it sports a non-removable Li-Ion 3400 mAh battery. Moreover, Galaxy A10 features a 13 megapixel primary camera with an f/1.9 aperture. Whereas on the front, it sports a 5 megapixel camera for selfies. To check out more detailed Samsung Galaxy A10 review and unboxing, there are many videos available on YouTube. Furthermore, Galaxy A10 colors include red, blue, and black. On the other hand, if you compare Galaxy A10 vs M10, you would find that Galaxy A10 is better in all aspects. After the tremendous popularity of A10, there are rumors of Samsung planning to launch an upgraded version, Samsung Galaxy A10 Pro and Galaxy A10 Plus. But it is not confirmed yet. Samsung Galaxy A10 price in India starts from Rs.8490 onward. 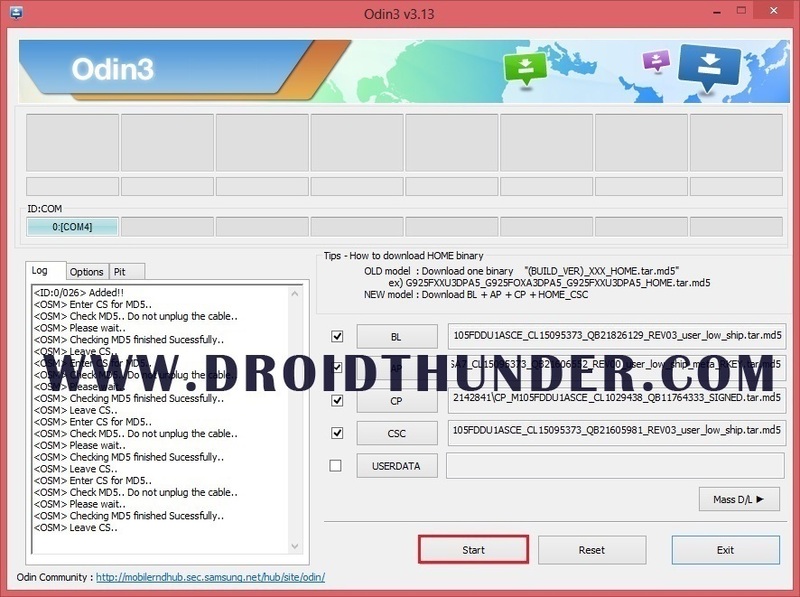 In this easy steps guide, we will manually flash latest official Android Stock ROM on Samsung Galaxy A10 using Odin tool. Note that this is an Indian (INS) OTA update with March 2019 security patch. 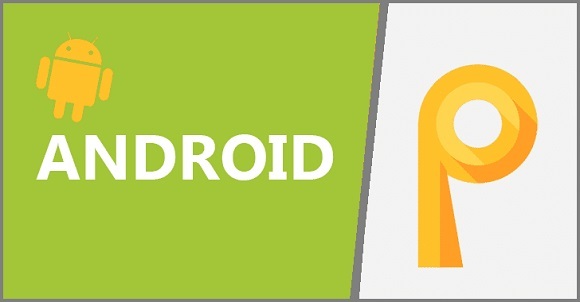 Moreover, this firmware is based on Android version 9 Pie with build number A105FDDU1ASCE. 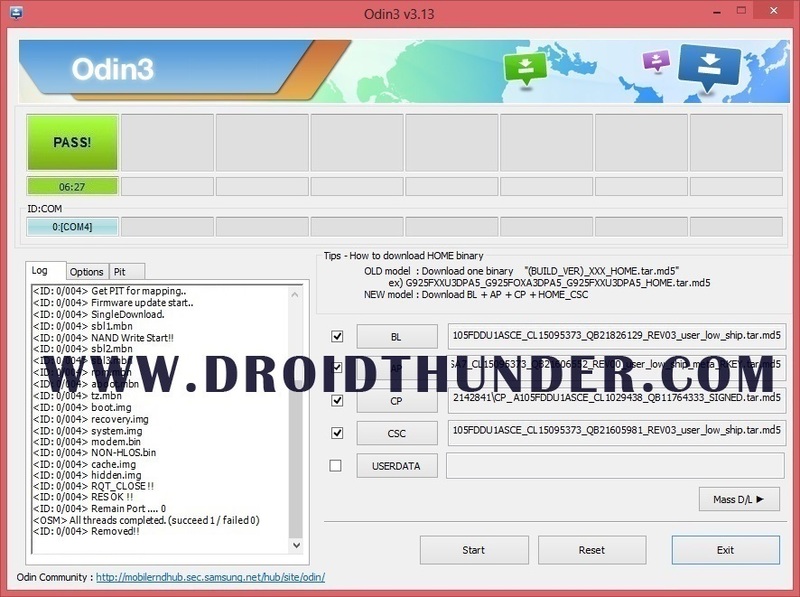 We provide Samsung firmware Google Drive link for fast download. Proceed ahead to the installation process of Android 9 Pie DDU1ASCE firmware on Galaxy A10. Follow the steps mentioned below at your own risk. Do not implement anything by your own. Furthermore, the firmware used is property of their respective owners. Install this software update only on Samsung Galaxy A10 having model number SM-A105F. Flashing this Stock ROM on any other device might cause damage. Hence confirm your device model number before going further. Charge your phone at least 60%. Backup contacts, apps, messages, call logs, notes etc. Install Samsung USB drivers on PC so as to detect your phone when connected via USB cable. Download Samsung Galaxy A10 USB Drivers. (Optional) Temporary disable all the security tools as well as antivirus on your computer. Step 2: Extract the downloaded INS-A105FDDU1ASCE.zip firmware file on your computer. 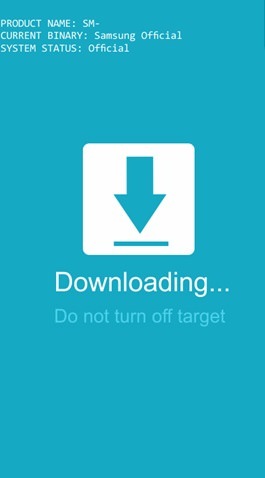 Step 3: Now power off your mobile and restart it into download mode. Step 4: For doing the same, press and hold Volume Down key + Power Button simultaneously. As soon as you see the following warning message, leave both the pressed keys. 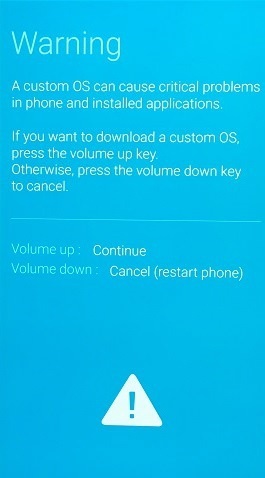 Step 5: Press Volume Up button to continue. This is how you can boot Samsung Galaxy A10 into downloading mode. Step 6: Using USB cable, connect your mobile to computer. Now verify whether the ID: COM section in Odin window is turned light blue or not. Also verify if an Added message is showing in the message box window or not. Note: If such thing doesn’t happen then it’s more likely to be problem with USB drivers. So re-install Samsung USB drivers from the links given above. If the problem persists, try changing USB cable or USB port. Step 9: Tick Auto Reboot and F.Reset Time Options. Step 10: Click on BL button present on the Odin window and select firmware file with ‘BL’ in it’s name. Step 11: Similarly click on CP button and open firmware file with ‘CP’ in its name. Step 13: Lastly click on AP button and select firmware file with ‘AP’ in its name. Note: The AP file will take little time to load. Step 14: Let us begin the Android Pie firmware flashing process now. For that, press the Start button on the Odin tool. This will initiate the actual Android 9 Pie firmware installation process. Note: Your device will automatically boot itself. Do not disconnect your mobile from PC. As soon as the installation completes, the ID: COM tab will change its color to green with a message ‘Pass’ on it. This will confirm that your Samsung Galaxy A10 SM-A105F is successfully upgraded to latest official Android 9 Pie A105FDDU1ASCE Stock firmware. Note: If Odin fails to install this Stock firmware on your Samsung device, then close the Odin tool, again boot into download mode and repeat the complete procedure again. Finally! The latest official Android 9 Pie DDU1ASCE firmware is successfully installed on your Samsung Galaxy A10 SM-A105F smartphone. You can confirm the same from Menu->Settings->About Phone. Let us know how this latest firmware is working for you.